Too long, too many! Yep too long a name and too many ingredients! Was it worth it? Many a times, I bake or cook to finish the leftover. And many a times I don’t! This is one time wherein I wanted to use up half-a-dozen frozen Bananas. I managed only 4.5 but my freezer is feeling lighter already! Carrots were specially bought for this cake. Buttermilk was freshly made and begging to be used up in a novel way – Buttermilk Glaze? Finger-licking yum! Vanilla Beans have been sealed in a test tube and forgotten in a hidden corner. I finally brought them out too! 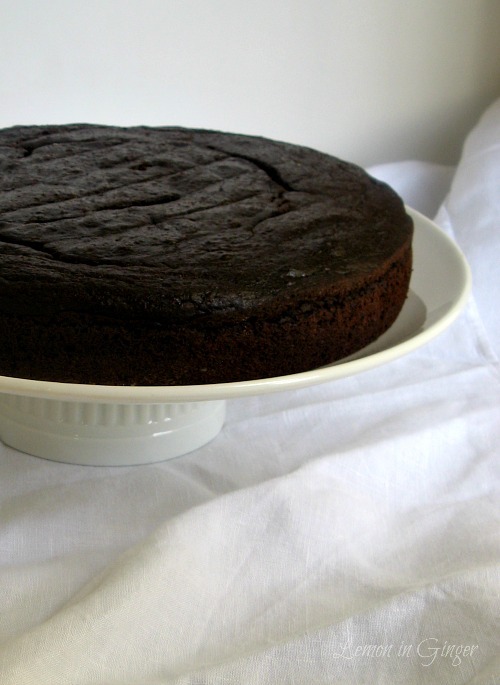 All in all a very healthy and different ingredients come together for this cake. My daughter literally gobbled it up and couldn’t wait for the slices to be cut. To mention she is only 18 months old. 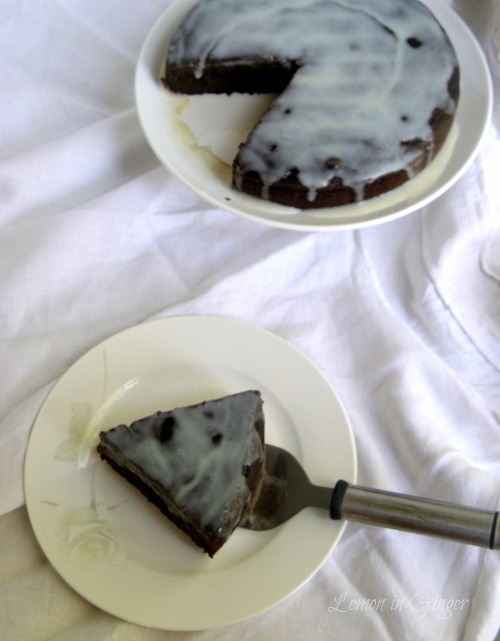 The cake was dense, moist and truly yum with a glass of milk or as a big slice like V! 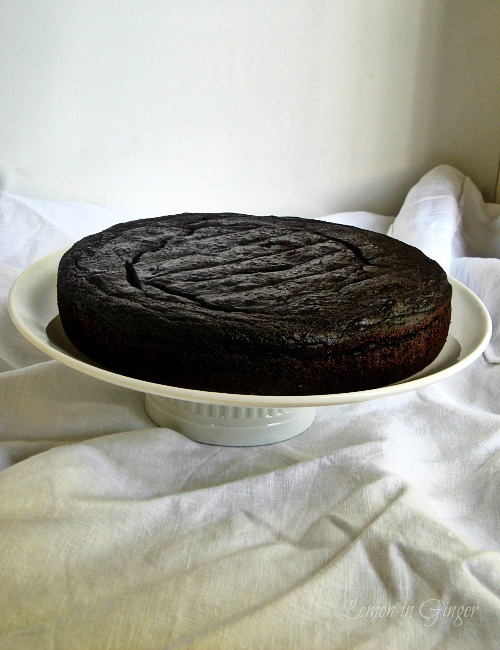 There were only few changes I made to the cake – I added 1 Tbsp of coffee to bring out the chocolate flavour more, used 4.5 bananas and baked in a bigger pan than original recipe. 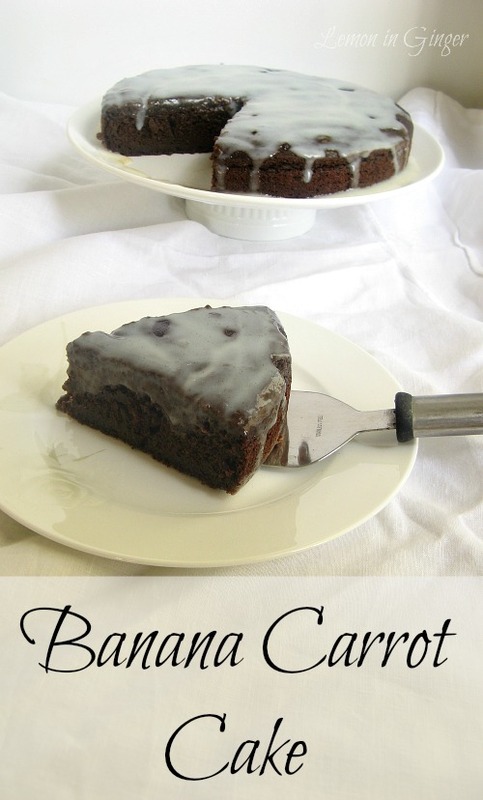 A healthy cake with goodness of Vitamins - Bananas & Carrots. And eggless too. It can be easily converted to Dairy-free or Vegan. Grease and prepare an 8 inch round pan. Preheat the oven to 180 C.
Sieve the flour, salt, cocoa powder, coffee, baking powder and baking soda together. Puree the bananas and carrot together in a blender. Add milk, oil and vanilla. Now add sugar to this liquid mixture and mix well. Add the wet mixture to the dry ingredients. Incorporate well and uniformly. Bake in a preheated oven at 180 C for 50-55 minutes or until done. 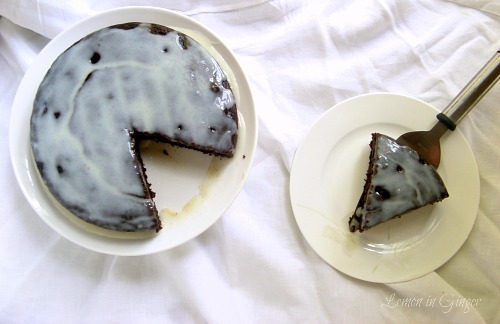 Allow the cake to cool in the pan for 10 minutes. Then de-mold and allow to cool completely on the rack. Combine all the ingredients except vanilla bean in a thick bottom small pan. On medium heat, bring to boil. Cook for a minute or until thick, stirring constantly. Remove from heat. Scrape the vanilla bean and add the seeds to the glaze. Allow to stand for another minute. Pour over the cooled cake. Slice and enjoy. You can use only 4 bananas as given in original recipe. Substitute powdered sugar for demerara sugar. Substitute milk for water for dairy-free version. Substitute oil for butter for dairy-free version.